Go with the Toyos. They are bit more expensive but have outlasted every other tire I've had on my 8,000 lbs. Cummins powered Dodge. I never got more than 27K on a set of tires, (and I've tried a different brand every time). The Toyos are still wearing great with over 37K on them! I could not find the brand tire that I bought in the catalog, as I bought the Telstar TURBOSTAR LT 235 75R 15, 6 ply tire. This is the 4th set of tires I have bought from this shop and they are the ONLY tire dealership I deal with. I know I am getting the best TIRE for the BEST PRICE ANYWHERE!!! The owner cares about customers and the employees are the most competent I know. I have recommended his business to some of my friends, and they have done business with the shop also and they all have told me they will be repeat customers with them. The shop stands behind their products, and the price they quote you is the price you pay, there are no hidden charges, which is great when you are on a fixed income like me. 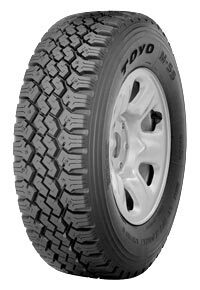 A good heavy duty tire for off-road applications. Sidewall resists cuts and punctures from sharp rock. Slippery on ice and in extreme cold weather. Tread wear isn't outstanding but what you would expect from a heavy lug tire.